Judge Roy Moore, also known as the Ten Commandments judge and Republican candidate for Chief Justice of the Alabama Supreme Court, told an audience yesterday that homosexual marriage will bring the demise of our nation. Moore was speaking to a local Tea Party gathering of approximately 100 individuals from Dekalb County. Next month, Moore is poised to regain his seat on the Alabama Supreme Court, from which he was removed in 2003. 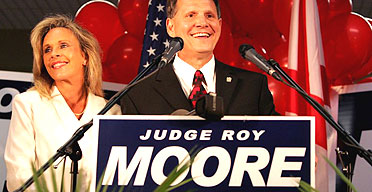 On August 23, 2003, a unanimous panel of the Alabama Court of the Judiciary removed Judge Moore from the bench. However, in his bid for re-election, the people have largely stood behind Moore, making his return to the Alabama Supreme Court highly likely. Moore notes, though, that he will not display the Ten Commandments if and when he is elected.